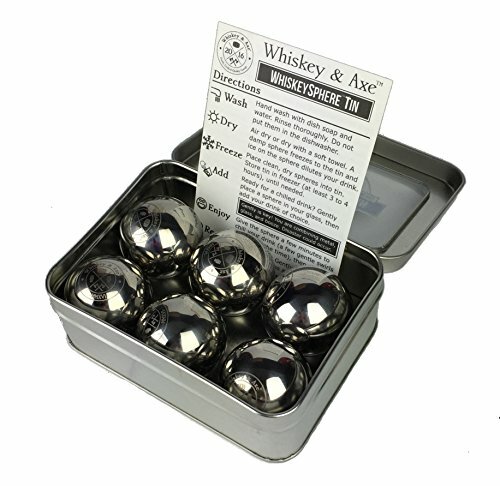 Our premium WhiskeySphereTM Tin contains 6 Stainless Steel Ice Spheres. Chill your whiskey without the dilution or numbing cold of ice. Fully experience the flavors you were meant to experience. Our WhiskeySpheres are the perfect size to fit into a Glencairn Whisky Glass (but work in any sort of glass, mug, or drinking device!) ______ HOW ARE THEY USED? Gently add a stainless whisky ball to your glass, then add whiskey. The order is important! Our WhiskeySpheres are big and create a big splash. Give the sphere a few minutes to chill your drink. A few tumbler swirls helps pass the time. Then enjoy. A WhiskeySphere can chill a 2 to 4 ounce whiskey by 20-30 degrees F without the dilution or overpowering cold of ice. With a slight chill, whiskey can open up allowing you to fully experience the flavor and complexity. ______ WHAT ARE THE STEPS TO USE THEM? 1) Hand wash spheres with dish soap then dry. 2) Store spheres in tin put in freezer for at least 3-4 hours. 3) When ready, gently place one sphere in glass then add 2-4 oz of drink. 4) Swirl drink for a few minutes to help chill. 5) Enjoy. 6) Repeat. ______ NOT A WHISKEY DRINKER? Though named for whiskey, WhiskeySpheres work great with wine, tequila, vodka, and other spirits. A fine Pinot Grigio on a hot summer evening deserves better than to be watered down with ice cubes. Sensitive to hot? Like tea? WhiskeySpheres can cool off your drink to a more comfortable temperature. ______ WHY SO MANY? Each Whiskey Sphere Tin contains 6 spheres. What this means is you can drink with friends. Or you can drink a lot all by yourself. We're not here to judge. ______ WHAT IS INCLUDED? Each Whiskey & AxeTM WhiskeySphere Tin Set contains: (1) Windowed Storage Tin (5" x 3 5/8" x 1 3/4"). (1) Waterproof set of directions. (6) WhiskeySpheres with the Whiskey & Axe logo. Each sphere is just over 1-1/2 inches(40mm). The perfect size to fit in a Glencairn Whisky glass. CHILL WITHOUT ICE OR DILUTION - Each sphere can chill a 2 - 4 oz drink by 20 to 30 deg F while retaining the original flavor. 6 PREMIUM QUALITY STAINLESS STEEL ICE SPHERES - Enough to invite friends and family to drink with you! Each sphere is a little over 1-1/2 inches (40mm) in diameter. The perfect size for a Glencairn glass! NOT JUST FOR WHISKEY - They work great for chilling wine on warm summer evenings or during long soirees. Chills vodka, rum, and other spirits brilliantly. Coffee or Tea too hot? Ease a whiskey sphere or two into your mug! HANDY STORAGE TIN - The storage tin keeps the spheres clean and together in your freezer. No icky velvet storage bags! If you have any questions about this product by Whiskey & Axe, contact us by completing and submitting the form below. If you are looking for a specif part number, please include it with your message.